The Women’s Empowerment in Agriculture Index (WEAI) is used to track changes in women’s empowerment that are a direct or indirect result of the US government’s interventions under the Feed the Future initiative to tackle global hunger and food security. A major goal of Feed the Future is to increase understanding of the multiple and overlapping connections between women’s empowerment, food security, and agricultural growth as a key means of reducing poverty and spurring growth in developing countries. 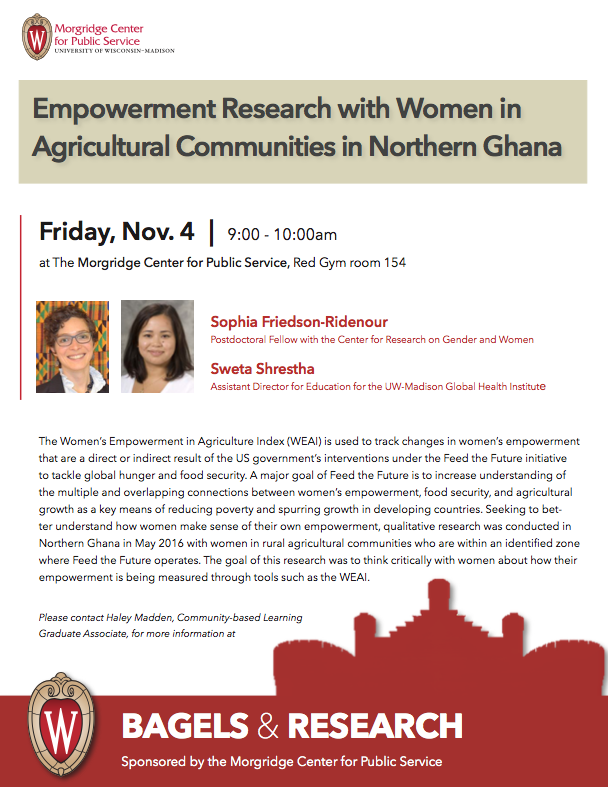 Seeking to better understand how women make sense of their own empowerment, qualitative research was conducted in Northern Ghana in May 2016 with women in rural agricultural communities who are within an identi ed zone where Feed the Future operates. The goal of this research was to think critically with women about how their empowerment is being measured through tools such as the WEAI.